Transverse Myelitis (TM), AKA Acute Transverse Myelitis (ATM) is a rare neurological disorder of the spinal cord, caused by inflammation and occurring across one spinal segment, leading to severe motor, sensory and autonomic dysfunction. In the MRI scan opposite, the TM lesion is the lighter, oval shape at center-right. The incidence of TM is 1 (severe) to 8 (mild) cases/million per year. It occurs in adults and children, in both genders, and in all races. A peak in incidence rates (the number of new cases per year) appears to occur between 10 and 19 years and 30 and 39 years. The mechanism of injury is inflammation of the spinal cord causing damage to the myelin sheath of the nerves. The symptoms of TM include muscle weakness, paralysis, parasthesia, neuropathic pain, spasticity, as well as bladder, bowel and sexual dysfunction. In some cases, symptoms progress over hours whereas in other instances, the presentation is over days. Neurologic function tends to decline during the 4-21 day acute phase, while eighty-percent of cases reach their maximal deficit within 10 days of symptom onset. At its worst point, 50% of individuals have lost all movements of their legs, 80-94% experience numbness, paresthesias or banding or girdling, and almost all have some degree of bladder dysfunction. Although some people recover from transverse myelitis with minor or no residual problems, the healing process may take months to years. Others suffer permanent impairments that affect their and ability to perform ordinary tasks of daily living. Most people will have only one episode of transverse . A small percentage (10-20%) may have a recurrence. MRI and/or CT scanning are invariably used in diagnosing TM. Up to 40% of cases have no findings on MRI. Lumbar puncture is used to look for surrogate markers for inflammation in the cerebrospinal fluid (CSF). Bladder function is almost always at least transiently impaired in patients with TM. 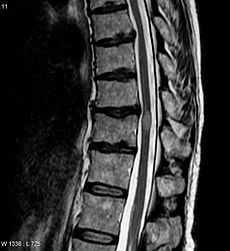 Immediately after the onset of TM, there is frequently a period of transient loss or reduction of neural activity below the involved spinal cord lesion; this is known as “spinal shock,” and generally lasts approximately 6 to 12 weeks, although it can persist for 6 months or more. At this stage, two general problems can affect the bladder. the bladder comes relatively insensitive, and thus becomes over extended and tends to overflow. An overly distended bladder increases the likelihood of urinary tract infections and, in time, may threaten the health of the kidneys. Depending on the dysfunction, treatment options include timed voiding, medicines, external catheters for males (a catheter connected to a condom), padding for women, intermittent internal self-catheterization, an indwelling catheter, Botox or electrical stimulation. Surgical options may be appropriate for some people. Some case series have estimated that approximately one third of patients recover with few or no lasting effects; another third have a moderate degree of residual disability, and one third remain severely disabled. The Transverse Myelitis Association is the world-wide organisation for TM and related rare autoimmune neurological diseases. This organisation is based in the USA and has close associations to medical and research communities specialising in neurological disorders. Their website is a good source of scientific information and articles on symptoms, treatments. The TM Society is a small UK based charity which offers information and support; they hold support group meetings throughout the UK, and also provide a telephone support service, answering questions on TM from patients, relatives or carers.